This shows the soldiers watering their mounts in the Sixmilewater river just behind Mill Row. This was one of the last photographs taken by Mary Young in 1915. Her two brothers along with several cousins and brother-in-laws were army officers. This is Margaret Neeson getting her protrait taken with George Neeson in 1901. This is Sergeant George Neeson serving with the royal Enniskillen Fusiliers out in India. Standing with him is his wife Peggy and the in the pram their daughter Madeline who lives here in Antrim. George served in the First World War by lying about his age he was really only 15 years old! These nurses are as pleased as punch and don't mind having their photograph taken for they have all passed their exams! Back row: Helga, Sheila Spendlove, Barbara Griffiths, Snr Jewes, Yvonne and Taffy. Front row: Alwyn, Unknown, Annie Nicholl, Audrey, Unknown and Kathleen. Relaxing by having a nice cup of tea and buns before going back on duty at the First Aid centre at this open air event. We have from the left Annie Nicholl, Unknown was a Anaesthetist and Snr Naes. Here on Church Street heading into town we have Mrs. Muriel Napier with her children Stephen and Glen in 1969. Well here we are in a photographer's studio where the Nicholl family are having their photograph taken. On the left we have young Rebbeca, then her dad Robert followed by the eldest Elizabeth, next is her brother Hugh and her mum Agnes. Finally in the front is the baby of the family James. It's 1915 and The First World War is raging in Europe but these young men are watering the horses, they are from the North Irish Horse Regiment. Sadly they would soon join their fellow comrades in France & Belgium and many would not come home again having made the ultimate sacrifice. They would come down Riverside to just past the Mill Row cottages there was a pathway led down the Sixmilewater River. These men were all Electricity Board workers in 1956. They are standing Norman McIlroy, Mr.Jackson, Mr.Jamison, Matt Quigly and Mr.Wright. Kneeling down is Andy Blair and Jimmy Nicholl. Here we have part of the Nesbitt family have a photograph taken around 1880. On the Left is Hugh Nesbitt and his wife Matilda Nesbitt nee Stewart and behind them is their only daughter Margaret Jane Nesbitt. They also had four sons William John born 28th February 1859, David born 25th March 1861, Alexander born 21st November 21st November 1863 and Thomas born 1st March 1865. Margaret Jane was born 1st January 1857, Hugh and Matilda where both born about 1832. Hugh died 14th March 1914 aged 82 years, Matilda died 11th July 1891 aged only 59 years and Margaret Jane died 28th August 1932 aged 75 years. The boys deaths are unknown but Hugh, Matilda and Margaret Jane are buried Craigmore Church. Decked out in all her refinery we have Margaret Neeson in 1904. Ten years later Margaret would emigrate to New Zealand to marry. Here we have Pat Neeson along with his wife Maggie and baby son George in 1900. They travelled all the way to Young's Studios in Ballymena to get this portrait taken. The son George has a dress on as all small boys back then did, can anyone tell me the reason why. As you can see Pat was a man of means in his three piece suit but why has he turned the bottom of his tousers up so much! This portrait photograph is of Corporal George Neeson in 1918 just after World War One had ended in which he fought and survived. When you look at his face and how young it looks remember there were thousands just like him that never came back. 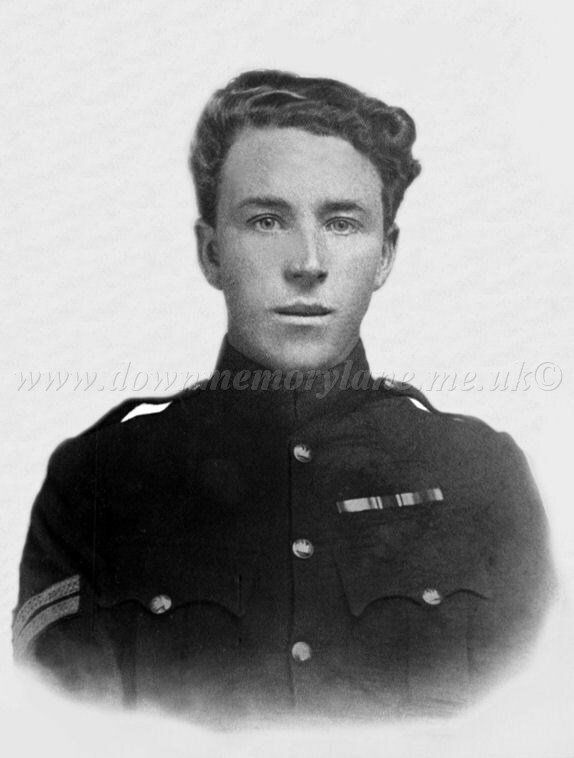 George signed up with the Royal Enniskillen Fusiliers in 1915, he was only 15 he lied about his age. This is James Nesbitt in the 1940's. This Wedding took place in Ahoghill at the Presbyterain Church in April 1943 and locals came from far and wide to see it. The man giving the bride away is Mr. Nesbitt and the Bride's name is Constance May Mabbott, behind them is Bertie Smith the Best man a headmaster at a school in Donegall. The bride by the way made her own Wedding Dress and she had come all the way from Leicester. The reason for such a large crowd is the Groom Robert Nesbitt was 52 still single and a writer, the two of them became penpals and the first time they saw each other was at the alter in the Church! This Roy Nesbitt getting photograph taken in 1947. It's the late 1950's and young Karen Neeson is being held by an attractive young woman called Madaline Dunn after her Christening. Next to Madeline is Jessie Neeson and finally Madeline's husband Hugh Dunn. This is Joan Nesbitt with her brother Roy and Sister Beatrice in 1945. This delightful portrait photograph are of sisters Joan and Beatrice Nesbitt in 1942. These are the Neeson children and were triplets. Sadly their names are unknown and two passed away in early childhood. 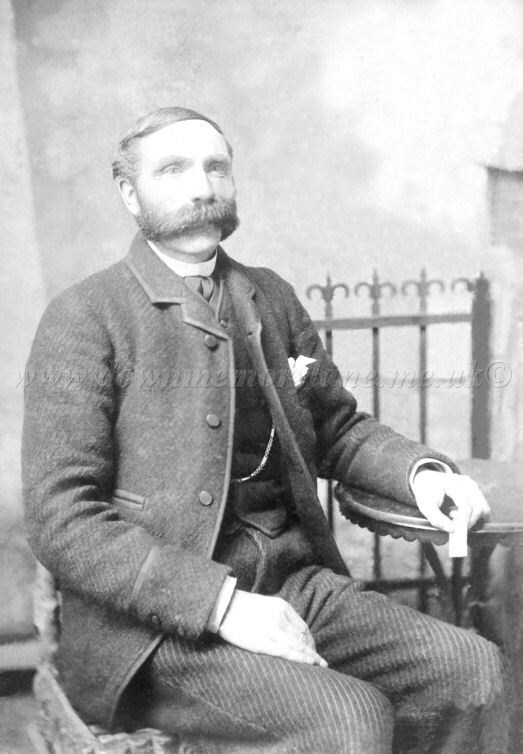 Sitting relaxing and enjoying a cigar at the Giant's Causeway is a dandy looking man called Mr.Neeson in 1900. Mr. Neeson who originally came from Antrim was over visiting realitives as he now lived in America. Here basking in sunshine are the Neeson family out in India who are far away from home back in 1937. On the left is Peter then his dad George who is a sergeant in the Royal Enniskillen Fusiliers, then Palmyra, next their mum May who was called Peggy for there were too many May's in the family and finally Dempsy. Hello I'm Clarice Edna Nelson outside our home at four months and I'm on my mum's knee who is Martha A Nelson nee McCombe who was born Oct 1890. It's September 1956 and we are at the side of the old post office owned by Eric Kyle in the yard of Lough Neagh Hotel also known as Sam Ankatells yard. From the left is Roy Nesbitt, Mrs Margaret Jane Gordon nee Nesbitt and Joan Nesbitt, Margaret was on a visit home from Duney in New Zealand. The car was new but does not belong to any of them, they posed at it because there were very few cars around back them. Here we are at Lough Neagh down by the Cutts with Joan Nesbitt back in September 1959. I don't know the boy behind Joan or why he has the rear wheel of his bike in the water. If you look closely at the top of the wheel you will see a white object. This is a dynamo wth a small wheel which you put against the side wall of the tyre and when you cycled your lights on the bike would light up. No it's not Marylin Monroe it's our very own Beatrice Nesbitt aged 14 back in the summer of 1953 on the family farm in Taylors Town. The No.1 hits that summer were Lita Roza singing ' How much is that Doggie in the window ' also Guy Mitchell with ' Look at that Girl '. All that is known about this photograph is that she is an Neeson. This well-to-do chap getting photograph taken at Thomas Erwin Studio 76 Church Street Ballymena. All is known is that he is an Neeson and on the back of the photo was the address 12 Charles Street Ballymena.